Welcome to Napoli, a city where your taxi driver can greet you in the country by driving through a roundabout without steering the wheel nor watching the road for other kamikazes. Then, you soon find out he just made a stretch of road in the wrong way and the Carabinieri (the Police) that bumped into him didn’t bother to say a thing. It’s chaos, but it’s all OK, ragazzi. Looking up the buildings you get a first impression of what’s to come. A city in ruins, dirty and muddled, ma non importa. Loud is another word that crosses your mind. Italians are shouting all over the place, but they put on a smile, so it’s not like they’re discussing all the time. Touring around the centre leaves you baffled. Everyone seems to be on the street and the elders control everything through their balconies, a picture that will be persistent during the week. 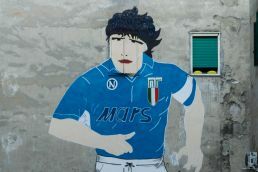 There are two things that you won’t miss: Gesù and Maradona. And please, don’t forget to order a Margherita. This pizza is probably the best companion for your first day in town, a (quite literal) pool of flavours although it’s the simplest pizza ever made. Food is great everywhere you land. Yesterday I forgot to say that there is a third thing you won’t miss in Napoli: graffitis appear in every possible surface and shape, including the central train station where I got the train to ancient Pompeii. The scavi (digs) is a gigantic place and the heat will crush anyone to its dusty floor, so be sure to bring your sunscreen, a hat and a gallon of water. Although it is impressive, I wouldn’t say the ruins are very different from what you get in a lot of other European cities. They’re bigger, for instance, but the true difference is that after being covered by lava the city has been naturally preserved. The petrified corpses are something unique, but all in all half a day is enough to visit the site. 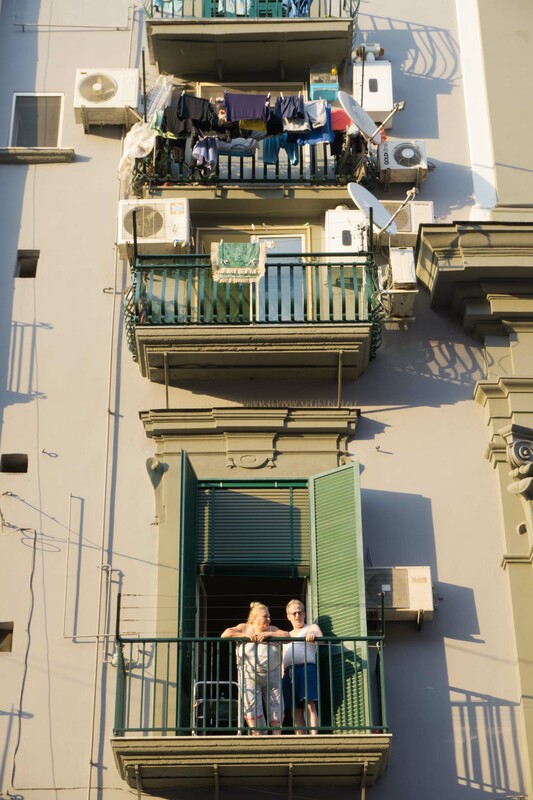 Coming back to Napoli, I return to my favourite place in the city, il Quartiere Spagniolo, a place where you see the south of Italy in raw. 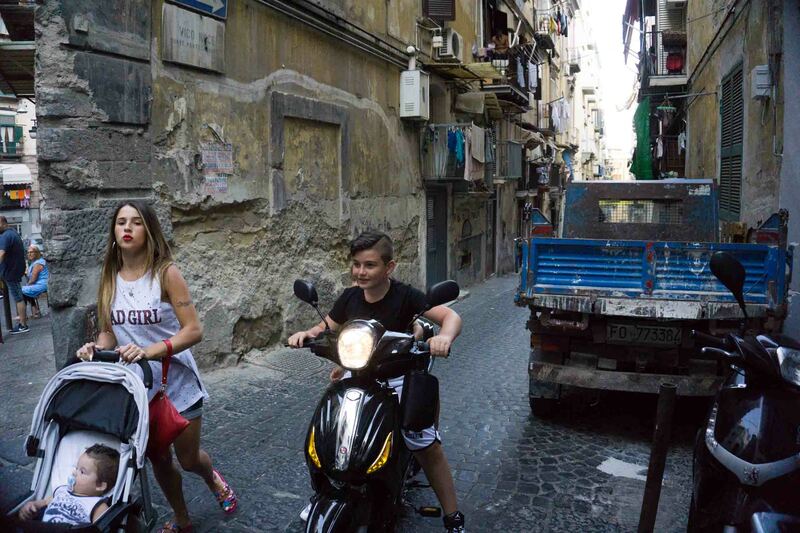 People all over the place, narrow streets, open doors, crazy kids with motorcycles and girls with strollers. This neighbourhood is one of the poorest in the south of Italy but it’s literally next to the main shopping artery of the city. It would be like being one street away from the 5th Avenue in New York or Passeig de Gràcia in Barcelona. 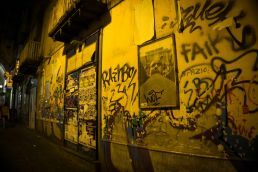 A random walk will take you to different Maradona sanctuaries represented by street artists. The window and street life brings you back to the 70s or 80s, although two minutes from there you’d enter back into the 21st century. During daylight, there is absolutely no risk in walking il Quartiere despite sensible minds would see it as a place of constant trouble. There is one more thing, the place smells like trash (and I don’t want to imagine when the Mafias that control the cleansing companies went to strike a few years back). For me, nonetheless, it was an enchanting spot and a must visit in the city. 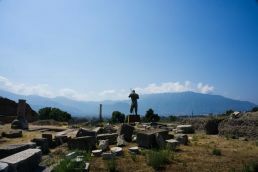 A sculpture presides the scavi de Pompeii recint. The rest is dust and history. Quick Tip: Start your walk in Vomero, a neighbourhood in a hill that features a funicular, a castle and awesome views of the sea and walk down to il Quartiere Spagniolo through the steep rampe dei Petraio. The good thing about Napoli is that you get so many options in a small portion of land. 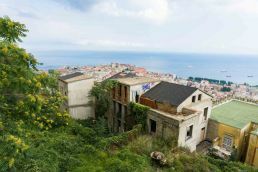 You get the Vesuvius —a mythological volcano which I couldn’t hike because the mafia lit it on fire for economic interests—, the ruins in Pompeii, a busy and rowdy city such as Napoli and, finally, the astonishing Amalfitan Coast, which is a world of its own. 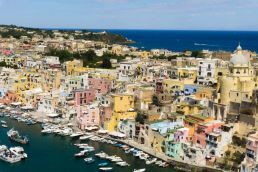 Oh, and the tiny yet beautiful islands, such as Procida, the smallest of the three pieces of Mediterranean land that precede the Gulf of Naples. In the middle of August, anything related to the beach can be suicide if you expect small crowds. Minding that, though, this tiny island offers a colourful visit after a 30 minute ferry ride. Your legs, given it’s only 4km2, can work out the rest. 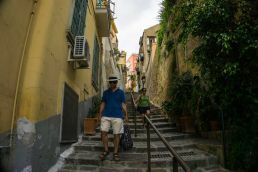 Procida is so small that I couldn’t write much more about it. Trotting around will get you to the best views on the island and I recommend getting the local bus (a trap if you don’t mind the timetables) because it’s a funny experience. When the L1 stops at the harbour, the masses attack both doors and swarm the vehicle. Where 10 would fit, 30 get in and the driver churns through the tourists and locals to get every single penny for the ride. Luckily, it’s a place with good spirit and an Italian family greets me with smiles and offers some help. I’m feeling bad because I’m ruining their home, but they are more than OK with it. The bus takes us to the beach, a very Italian version of it. Umbrellas everywhere and just a grain of sand for those who would rather soak under the sun. It’s very tight and packed, and although the water is superb, I would skip the swimming time. 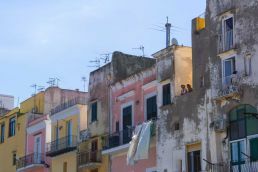 Definitely, the best thing to do in Procida is walk around town and hike to the churches atop the hill to get the best views of this colourful island, a bucolic spot with a certain romantic flare. Don’t miss it. The views from the highest point in Procida are exactly why we dream of living in an island.